OK, this was always on the cards! Having effectively lost 80m during the Gozo storm of 2012, I was sure there was scope for improvement and our usual October half-term family visit provided another opportunity to look for a site with better all-round take-off and without the suicidal access road and boggy ground. 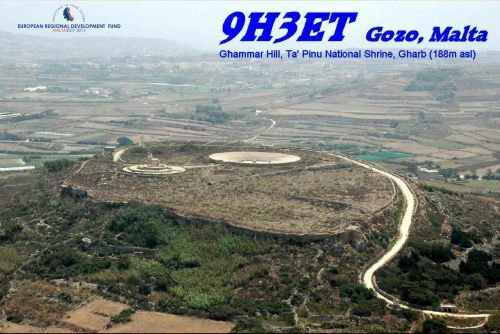 This time I had another look at the National Shrine that had attracted me previously and made tentative enquiries at Ta Pinu Sanctuary, across the road from which lies Ghammar Hill, which has a flat top of several acres and a near 360 degree take-off. OK, it was pretty dry in October but the winter was expected to change that drastically. A formal approach was made on return home, with the kind assistance of local resident ex-pat Colin Thomas 9H4CT, who provided the all-important on-site presence and diplomacy. Within a few weeks, I had the blessing of Fr. Gerard Buhagiar, Rector of Ta Pinu, who was kindness itself. 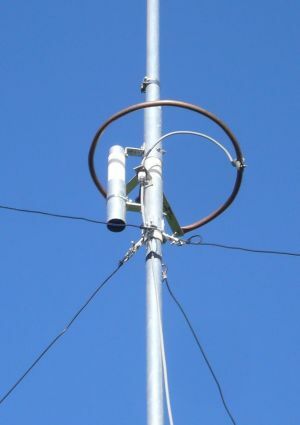 Investigation into 5/8 wave verticals produced a concept for 3 separate antennas for the HF bands, each fed in a similar way to the commercial verticals from ZeroFive Antennas, to whom appreciation is due for the hi-res photographs of the matching networks on their website! My solution is not a lot different � photo shows the 15m version. 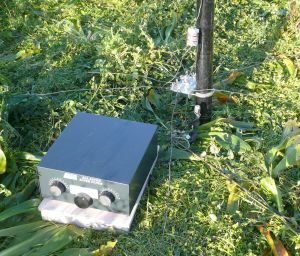 The resultant antenna configuration had the merit of individual SWR adjustment. Comprehensive testing before departure indicated that all 5 could be tuned to a SWR of 1.2:1 or better, thereby avoiding the need for an ATU and improving QSY speed considerably. So much for the planning! What could possibly go wrong this time? Access road, antennas, site, all ticked the box. Even the family Alhambra, which had been written off the previous year as uneconomical to repair (following loss of bumper and various bits of underbody damage) had been re-purchased as salvage from the insurance co. and repaired (to MOT standard of course!) using parts from eBay. Most unfortunately, my wife was unable to get time off from work this year and so it would be a solo drive. However, my lovely sister-in-law and husband, now permanent Gozo residents, offered to put me up. We now come to the lessons learned section of this story! The drive from the UK went well until 5 minutes before loading on to the last-but-one ferry from Sicily to Malta, when a fellow passenger helpfully noticed I had a flat tyre, which would of course make it impossible to board. The car being laden to the proverbial gunwales made jacking out of the question, even if I could have reached the spare wheel, or indeed the jack. The same kind gentleman suggested a pumping regime to get the vehicle on to the ferry and a repeat performance to get it off, all of which worked, the tyre staying up for around 15 minutes each time � phew! Lesson 1 � apparently silly suggestions can work! Upon fetching up on Valletta dockside at around 21.00 on the Sunday night before BERU, with a rapidly deflating tyre and around 30 miles and a final ferry crossing to reach my Gozo accommodation, I remembered having packed a couple of Halfords tyre foam get-you-home canisters. One of these leaked all over the place but the second did actually do what it said on the tin. Lesson 2 � never be without one (or 2!) of these marvels. Lesson 3 � also carry one of those stitch-in-time jobbies, with rubber strips, big fat needle and rubber solution, which can, at a pinch, repair a tubeless tyre in situ. Note these are only suitable for a tread rather than a side-wall repair, but the kits are available economically on eBay. 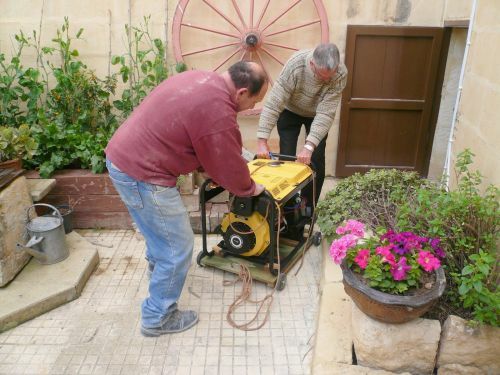 I was due to meet the Rector of Ta Pinu early the following morning and so unloading and repairs proceeded immediately, finishing around 04.00 . . .
Day One (Monday) All this proved worth-while, as I had a very warm welcome from Fr. Gerard, who was waiting for me on time at the Church, gave me the key to the road barrier leading up Ghammar Hill and offered me use of a storage room under the amphitheatre at the top of the hill. What could be better? The rest of Monday was spent surveying the site and laying out the verticals and their guy-points with the markers I had remembered to bring. Day 2 (Tuesday) saw the guy points being installed, something that had taken little more than a couple of hours in the boggy farmer s field of 2012, using the same 40mm spiral fixtures. 8 hours later, with darkness fast approaching, several obstinate ones were not holding, including one which would have to be drilled into the bedrock. It became clear that the site consisted of 6 to 12 inches of bone-dry sandy soil over a porous sandstone bed. The only thing that kept the anchors in place were the roots of the local fennel, which luckily grows almost everywhere on Gozo. A quite exhausting day � I treated myself to a posh meal! Day 5 (Friday already) which was dry and fine and 1.1:1 was easily achieved on the 10m antenna. The rest of the day was spent laying out feeders, deploying the diesel genny and laying out the station in the back of the Alhambra. All done before 16.00. 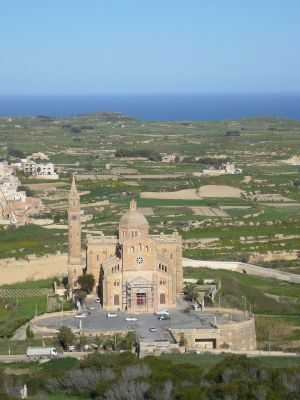 Quite an impressive sight � I was told later that the installation could be seen from most of Gozo! I was going to spend the night on site and so there was time to check everything out, have a couple of hundred non-BERU type QSOs, program the keys on the P3 the way I wanted them and set up some CQ BERU messages on the ETM9C keyer, with a few speed-ups for the personal benefit of Chris SJJ! The station consisted of a K3/100, P3 and a Top-Ten switch box, which automatically followed band changes on the K3. DC for the K3 was supplied by an elderly BNOS 25A supply, which had been used the previous year and allowed full output of 100w to be achieved. No ATU was needed and a few trial QSYs worked well. This time, the forecast for the weekend was fine and so it turned out. During those initial QSOs a niggling worry developed that my signal wasn t all that I was hoping for, but not much could be done at this stage, so . . . on with the show! 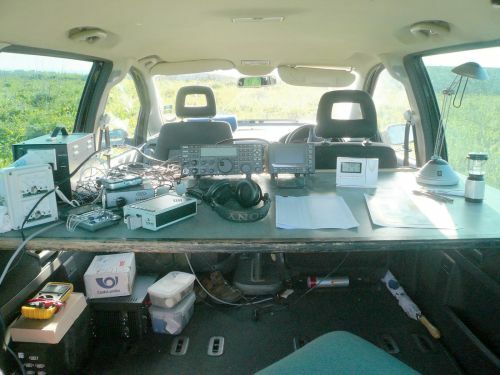 I was woken by the sun streaming into the car at 6.30 AM � only 4.5 hours to go � time for a few more test QSOs. Part of the deal with Fr. Buhagiar was that I would produce a rather splendid fold-out QSL card describing the rather wonderful location, with it s 14 high quality marble statues which lined the road to the top of Ghammar Hill and formed a Via Crucis. 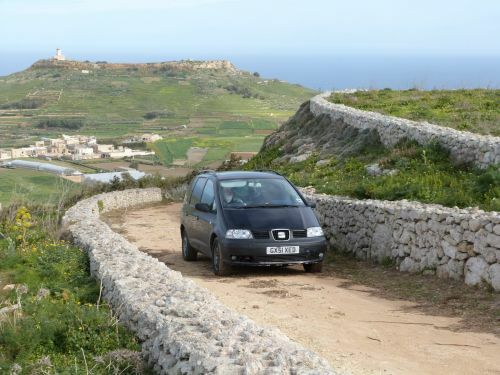 The whole project was part-EU funded around 10 years ago but Maltese planning restrictions have prohibited the access road being concreted over and so annual maintenance will always be needed. It is hoped that one or two of these QSLs could deliver visitors who might be persuaded to contribute a few pennies! Nearly 2000 of these cards will go out altogether. And so � here we go! HF bands are sounding a lot better than last year, with 10m open early, but not to the UK, as yet. Never mind it will all happen later. In the end, only the GM s from the UK really got a look-in on 10m, with a few of the other better-equipped Gs making a scratchy QSO. Rather a lot of easy QSOs missing then � Hmmmm. Still, the other bands and DX on 10m were sounding good, but I was having more trouble than I expected raising bonuses in competition with the pack of Gs. Comparing numbers (as one does!) with the Caribbean and Cyprus contingent was not encouraging � everyone was really getting away! Still, the bonus score, of which I was keeping track on a set of patent dupe sheets, was looking OK and on target to beating that of last year s winner. 80m � waste of time with the WSEM � still there ll be plenty of time after midnight. Unfortunately, after midnight hardly materialized. At 00.50, alarming sounds were coming from the genny and the desk light flickered and then went out altogether. The K3 was still alight because I was also using the 12v PSU to charge the vehicle battery, but I knew this was not man enough to deliver anything like 100w. OK, disconnect everything and run up the genny on its own. The gods of this place are shining on me � it s still delivering 240v. It looks like being a fault in the RFI filter, so I disconnect that and all is OK for a few minutes, before the problem re-occurs. Now it looks like the BNOS supply, circa 1985. So, torch in hand, I hot-foot it the few hundred yards to the local storage room and return with the spare PSU, which I had brought along because there was room in the car for it, but had never been tried in anger at full power with the K3. At anything above 30w, it caused the radio to shut down abruptly, losing the P3, RIT and some other settings. This happened during a couple of QSOs, for which apologies (although I was able to get back quickly enough to complete them). So, wind back to 25w and an occasional edge up to 30w when I was feeling brave . . . It soon became apparent that not a lot was happening in response to CQs and so most of the last 8 hours was spent S&P, with a few short runs to the UK. By the time I was back up at nearly 02.00, things were looking so interesting on the higher bands that I clean lost track of what I was supposed to be doing on 80m, returning as it was closing in Malta and just too late for J88DR and 6Y6T, much to my chagrin. Those last morning hours were still great fun, with more bonuses than I usually achieve at that stage in the contest and the thrill of the chase for the 1000th QSO � just made (including dupes of course!). But I was pleased that the conditions had favoured the more northerly stations and marveled at the QSO rates achieved by Daves BUO and TBK, John, Nigel and the two C4 stations in particular, with several of the other Canadians also doing extremely well. After the event, I compared my signal on the various RBN stations and found it seriously down in most directions compared to 2012, especially the UK. This was also confirmed by a very useful report from Bryn G3SWC. I put this down to a combination of the extremely lossy site compared to the boggy conditions of 2012 and possibly the lower angle radiation from the 5/8 verticals, although these had done OK at the longer distances. I m not sure about the latter because the effect was the same on 40m, where the antenna hadn t changed at all from 2012 and used the same 4 elevated radials. Nevertheless, a thoroughly enjoyable BERU was had, with wonderful conditions that I wouldn t have missed for the world. Thanks to all who called or responded, especially during those last 8 hours of the contest, when I was severely handicapped on output power. Grateful thanks are especially due to Colin 9H4CT for the invaluable help and encouragement he provided during set-up and earlier site negotiations, to Fr. Gerard Buhagiar and his staff for their help and encouragement in allowing me to use their beautiful site and, not least, to sister-in law Mary and her husband Paul, who put up with a variety of kit distributed throughout their (formerly nice and tidy) farmhouse in Sannat, Gozo at various times and also provided tasty nourishment during the contest. (photo shows neighbour John with Paul).